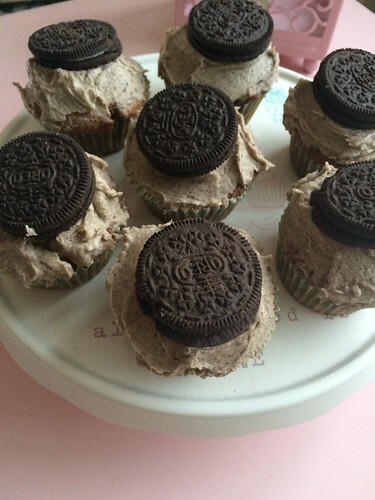 t*rexes and tiaras: Oreo cupcakes.. 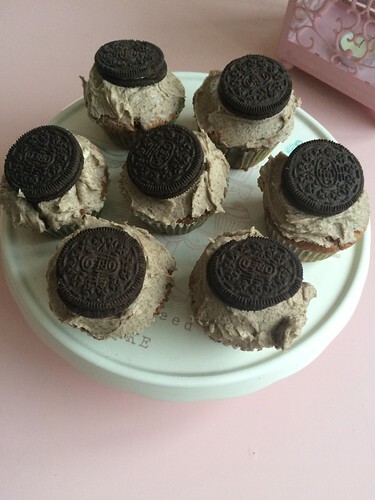 I made time on Monday to whip up a quick batch of Oreo cupcakes for a friend, and figured I may as well share the recipe. So, the basic method I use for just about every base for cupcakes is this. I start by weighing three eggs (in their shells), and then use that weight to determine my quantities of sugar and butter, cream that together and add the eggs, the same weight of flour (SRF if I have it, plain flour if not, with 1/2tsp baking powder per 200g flour will have the same effect), and then add my flavouring. In this case, I added a tablespoon of cocoa powder to the mix, and a splash of milk to thin it down a little. I then split the mixture into muffin cases and baked in a 180c oven for about 8 or 9 minutes. I usually do the check with a skewer to test that it's baked through. If the skewer comes out clean, you're fine. For the icing, I put two Oreos into the blender, and whizzed them up to dust, then added that to 100g of butter and 150g icing sugar. Once the cakes were cool, I iced them and added another Orwo onto the top. I assume they taste good - I can't stand Oreos, so didn't try them but they were well-received and took about 30mins, start to finish. Do you have any fail-safe recipes? I made my Christmas cakes this week as well, so will no doubt share those soon. I'm not that fussed by oreos either but I'd give these a try. A chocolate cake is a chocolate cake so I'd definitely eat the cake gladly. They look impressive! Yep, the cake itself is just simple choc sponge. I sort of like making things I wouldn't eat myself - easier to resist temptation! These look great, Char. I've never baked with oreos before as I still can't decide whether I actually like them (I'd rather have a custard cream!) My fail-safe recipe is the same as it's so versatile. My other favourites are Mary Berry's lemon drizzle cake or banana loaf. Bleugh, custard creams are like my worst nightmare in biscuit form. I think my Nan taught me the weigh-your-eggs trick and I've never looked back! Oooo I think I need to scoff a couple of these pronto Char! I'm not a fan of peanut butter either, so I've never baked with that.